If you’ve ever listened to The Voice of Korea on shortwave, you’ve probably heard broadcasts from this transmitter site. Kujang is one of the largest transmitter locations in the DPRK with, according to official records, 5 shortwave transmitters each capable of delivering a 200kW signal. That’s powerful enough to reach most corners of the world, given a clear frequency and good conditions. 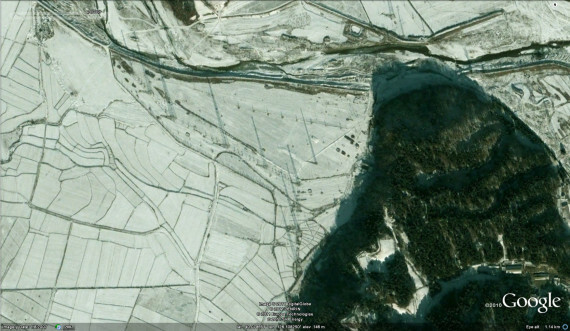 North Korea doesn’t publish detailed locations of its transmitter sites, but a bit of digging around on Google Earth and cross-referencing with Curtis Melvin’s North Korea Uncovered Google Earth file and the World Radio TV Handbook led me to this location. Explore it yourself on Google Maps. Despite carrying the name of Kujang, which is about 25 kilometers from the site, it’s in Hyangsan County and lies 7kms from Hyangsan City. 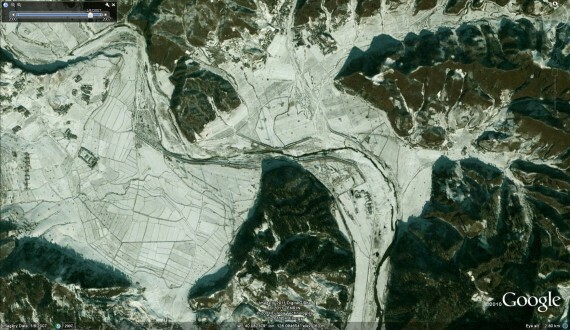 The site is about 95kms north-northeast of Pyongyang. This image shows the entire site. The transmitters are easily visible thanks to their shadows, which run north-northwest in this image. Shortwave remains an important means of radio transmission for the DPRK. It’s used both domestically to relay state-run Korea Central Broadcasting Station (KCBS) and for international services of The Voice of Korea. VOK recently opened a website with on-demand audio, but it doesn’t carry any live programming and doesn’t have a transmission schedule. You can find one on this page. 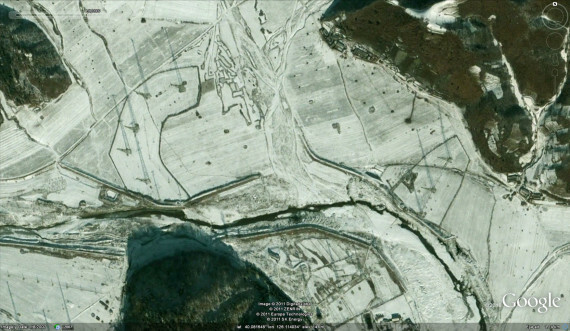 In addition to Kujang, the DPRK is also reported to have another equally large site in Kanggye and an even larger site in Pyongyang. I haven’t yet been able to find either. 4 Comments on "Kujang shortwave transmitter site"
It seems to me that the shadows are much shorter than the actual radio towers. How long do you think the shadow would be at noon local time? For anyone looking though coordinates. QSL Please. I send you a Card for QSL,but NO anwser. Please could you send me a calender. Johann R. Sedlak Esslinger Hptstr 9 1220 Vienna- AUSTRIA. Thank you. Speak English and German.